Click here to find a throttle position sensor for your vehicle. Throttle position sensors are unique among engine sensors, in the sense that these are the only sensors that directly “translate” driver inputs into changes in the vehicle’s speed. As such, throttle position sensors play a critical role in how well the ECU (Engine Control Unit) manages the overall operation of the engine. Note that throttle position sensors should not be confused with throttle pedal position sensors, which are used by drive-by-wire throttle control systems in which there is no physical connection such as a control cable between the throttle pedal and the throttle plate. As the name suggests, a throttle position sensor’s function is to monitor the position of the throttle plate, and to transmit that information to the ECU (Engine Control Unit) via a dedicated signal circuit. In practice, this information has huge implications for the ECU’s ability to control the engine and fuel management systems. For instance, if the throttle position sensor indicates that the throttle is 5% open, implying that the engine is running at about idling speed, this value is compared to input data from several other engine sensors. These would typically include the Intake Air Temperature Sensor, Mass Airflow Sensor, Manifold Absolute Pressure Sensor (if fitted), Engine Coolant Temperature Sensor, Throttle Pedal Position Sensor (if applicable), and others such as the Engine Speed Sensor, Vehicle Speed Sensor, and sometimes the Camshaft Position Sensor(s) if the engine is equipped with variable valve/camshaft timing. If the engine and fuel management systems are fully functional, all the data from all implicated sensors will correlate, which is another way of saying that all the input data from all implicated sensors confirms that the engine is indeed running at about, or just above idling speed, which requires a throttle opening of about 5%. Thus, if the throttle position sensor is fully functional, it will indicate a 5% throttle opening. This value also serves to confirm the correlation of all other relevant input data with that of the throttle position sensor. Assuming that the engine and management systems are fully functional, the position of the throttle plate will always correlate with the input data from all other implicated sensor throughout the engine’s operating range. However, since throttle position sensors contain moving parts, these parts can wear out over time, which can cause the sensor to start relaying false, incorrect, implausible, or out-of-range throttle positions to the ECU. It should noted that while most ECU’s have the ability to compensate for both the wear and the loss of sensitivity of most sensors, this ability is very limited, and variations of only a few percent between the desired and actual throttle positions will set one or more trouble codes, and may also illuminate a warning light. In most instances of throttle position failure, a code will be stored on the first failure, and the CHECK ENGINE light will be illuminated. However, since these sensors can fail gradually over time, fail intermittently or sporadically, or fail completely and suddenly, the warning light may illuminate intermittently, or permanently, depending on the nature of the failure. For modern cars, you can scan fault codes stored by your ECU using an OBD2 Scanning Tool. Depending on the nature and degree of the failure, the idling quality may be poor, or the idling speed may fluctuate wildly as the result of random movements of the throttle plate if the sensor is worn out. In some cases, the engine may not idle at all, or stall unexpectedly and repeatedly. This can happen if the throttle position sensor over or under reports the position of the throttle plate, which causes the ECU to send invalid commands to other sensors and control systems. Almost all failures will cause a significant increase in fuel consumption when the ECU starts to disregard all input data from the throttle position sensor, and initiates default, or “fall-back” fuel delivery and ignition timing strategies. In some cases, the ECU may initiate a limp mode as a safety measure. In this condition, the ECU will severely limit the engine speed and may also prevent gearshifts on automatic transmissions to damage to vehicle components until the issue can be inspected. Throttle position sensors are invariably fitted directly onto the throttle body in such a manner that its moving parts can engage directly with the throttle plate’s spindle. Thus, replacing the sensor is simple, straightforward procedure that should be well within the capabilities of even novice home mechanics. Note that depending on the application, you will need a set of screwdrivers that includes both Phillips and flat-tip screwdrivers of various sizes. In some cases, you may need a set of small Allen wrenches, or in rare cases, a set of Torx screwdrivers. Step 1 – Locate the throttle body in the inlet tract, and disconnect the electrical connector from the throttle position sensor. Step 2 – Using a suitable tool, remove the sensors’ retaining screws, and place them safely aside. Pull the old sensor away from the throttle body, fit the replacement in its place, and insert and properly tighten all retaining screws. Note that since some throttle position sensors are adjustable, it is important to fit the replacement sensor in exactly the same position as the old sensor. Failing to do this could prevent the ECU from learning the closed position of the new sensor. Step 3 – Reconnect the electrical connector, and start the engine to verify the repair. Note though that on some applications it is necessary to clear all fault codes, and to perform a prescribed relearning procedure after the sensor replacement. If a scan tool is not available, refer the vehicle to a repair shop for professional assistance with this step. However, in most cases, the stored trouble code will clear automatically after the completion of a few drive cycles. Dorman throttle position sensors are designed to be direct-fit replacement parts that meet and often exceed OEM performance and reliability standards, having undergone stringent testing and quality control tests. In addition, all Dorman throttle position sensors are usually supplied with all required hardware to ensure a trouble-free installation. Unlike most other suppliers of engine sensors, Dorman offers dedicated technical support should you run into trouble selecting the right part for your application. Overall, we’ve had good luck with them over the years and suspect that you will also have a good experience if you use a Dorman TPS. 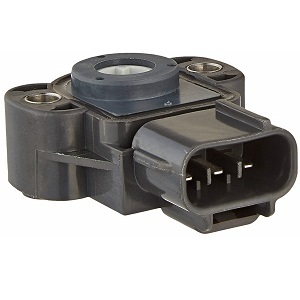 Click here to find a Dorman throttle position sensor for your vehicle. Standard Motor Products designs, manufactures, and distributes an extensive range of engine management sensors for almost every conceivable application, thus ensuring that Standard Motor Products can supply sensors that were designed specifically for your needs and requirements. Their throttle position sensors, like their other parts, are high quality and are built to last, so you won’t find yourself replacing your throttle position sensor again any time soon. Click here to find a Standard throttle position sensor for your vehicle. Walker Products is an ISO 9001-2008 / TS16949 certified manufacturer and distributor of a full range of engine management solutions for all applications sold in the North American market. Their commitment to designing, manufacturing, and testing of their products ensures that Walker products meet, and exceed OEM equipment performance and reliability standards. They make quality parts that will serve you well, so we can offer a solid recommendation for their throttle position sensors. Click here to find a Walker throttle position sensor for your vehicle.